Cook pasta al dente according to package instructions. When pasta is finished cooking, transfer pasta to a large collander to drain. Then immediately rinse it in cold water to halt the cooking. Transfer the pasta in even portions to the prepared zip top bags and seal. Use your hands to carefully combine the pasta and food coloring, and then let each bag sit for at least 1 minute to soak up the color. Then, one color at a time, transfer a bag of pasta back to the collander and rinse with cold water to remove any extra food coloring. Then transfer the pasta back to your original pot. Repeat with the remaining colors of pasta. 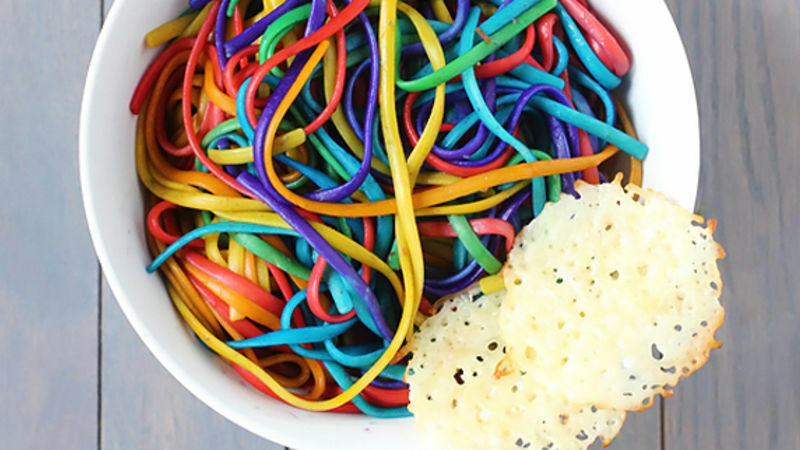 Toss all of the colors of pasta together to combine the colors. 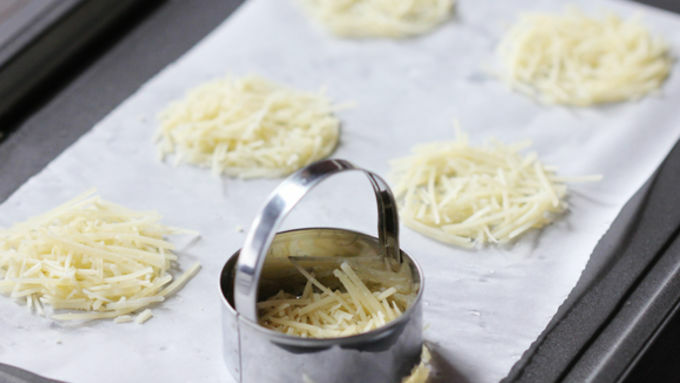 PARMESAN CLOUDS: To make the Parmesan clouds to accompany the pasta, preheat your oven to 350°F. Then, on a baking sheet lined with a Silpat or parchment paper, place about 2 tablespoons of shredded Parmesan cheese in a flat circle. You can use a cookie cutter to help you shape the circles, if desired. Bake for 4-5 minutes until the cheese is melted and the edges just begin to brown, then remove and let sit for at least 2 minutes. Peel off and serve. Plain spaghetti was by far one of my favorite foods as a kiddo, especially being an uber picky eater. But I’m pretty sure our spaghetti never looked like THIS! The fun rainbow technique will definitely make it the talk of the dinner table. And to complete the rainbow, I’ve also included a quick tutorial for making these quick and easy little Parmesan “clouds.” Too cute! First, you begin with the main ingredient: CARBS. Err, I mean, pasta. I used linguine, but you can pretty much use whatever shape of pasta you’d like. Cook it al dente according to the package instructions. But while it’s cooking, prepare the large plastic zip-top bags of food coloring. I used six colors (red, orange, yellow, green, blue and purple), but you can use however many colors you prefer. Add about 20 drops of food coloring and 2 tablespoons water to each bag. When pasta is done, drain it and rinse with cold water to halt the cooking process. 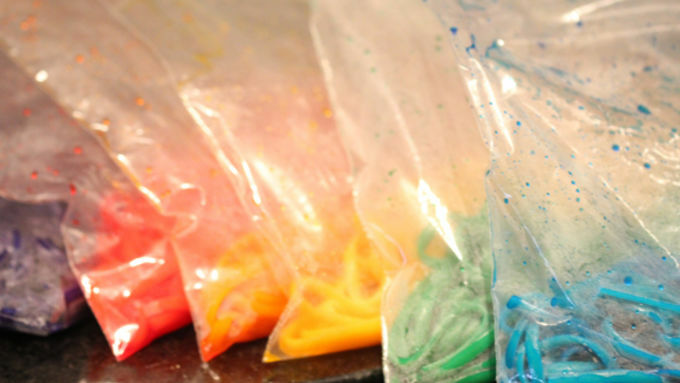 Transfer the pasta, portioning it as you go, into the bags of food coloring. Then seal the bags, and mix the pasta and food coloring until well-combined. Let each bag sit for at least a minute. One by one, return each bag to your strainer, give the pasta a second cold water rinse, and then transfer the pasta back into your pot. 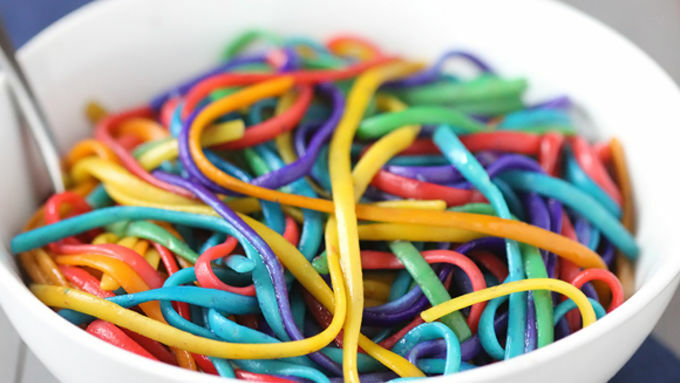 When all of the colors of pasta have returned, toss the pasta together until the colors are combined. And voila!